﻿The compact RTV400Ci features a heavy duty platform, air cooled Kubota single cylinder electronic fuel injected (EFI) petrol engine for chokeless quick cold starts, plus an advanced transmission with inertial clutch (CVT Plus) for excellent response and reliability with 4WD capability ideal for livestock, amenity or country pursuits. Ready for the season, the new RTV1140 offers exceptional versatility, power and all year round capability. Carrying up to 4 guns (plus dogs) comfortably, the RTV1140 is designed to work on the toughest terrains. 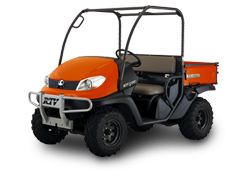 This quiet, compact RTV features Kubota’s durable liquid cooled EFI petrol engine and Kubota’s innovative variable hydrostatic transmission to deliver exceptional performance and reliability. The RTV500 is powerful and rugged enough to handle any terrain with outstanding traction and power with a comfortable operator area for a full day’s operation. 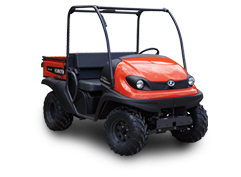 The all-new Kubota RTV-X900, brings a smoother ride, more comfort, even better drivability and more legroom to Kubota’s extraordinary RTV Series. So, wherever you want to go, whatever the terrain, you can count on the RTV-X900 to get you there.